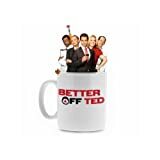 Better Off Ted premiered on ABC on March 18, 2009. For the team at Veridian Technologies, no achievement is too far-fetched. Need a suicidal turkey? Done. Need a metal that's as hard as steel, but bounces - and is edible? Done and done. The head of the research and development department, Ted Crisp loves his job. He loves everything about it. He loves his super human boss, Veronica. He loves his colleagues, Lem, Phil and Linda. Especially Linda. But most of all, he loves what they do. Straddling the threshold between science and imagination, the R & D crew consistently turn the ridiculously impossible into the hilariously plausible. The only problem with Ted's job is that ethics are not a part of company policy. As Ted says, "Work's not a question of right or wrong. It's only about success or failure." Luckily Ted has his precocious daughter, Rose to set him straight. But what happens when you start to take a closer look at your seemingly perfect job? Why is the company trying to cryogenically freeze one of Ted's scientists? What's with the new itchy chairs? Who's been stealing all of the creamer? It's not easy being a single father and a middle manager, but somebody's got to do it. After all, what would the world be without exploding pumpkins?